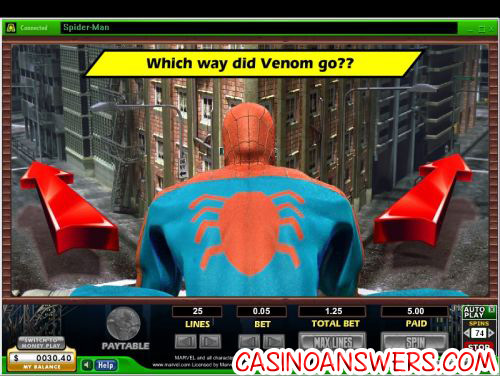 Spiderman Marvel Video Slot Guide & Review - Casino Answers! Whether or not you have read a comic book in your life, you’ve still heard of Spider-Man and are more than likely familiar with the character, no matter if you are young or old. With three movies, several different cartoon series, not to mention tons of lunchboxes and apparel he’s featured on, Spider-Man is arguably the most popular of all of the Marvel Comics characters. Play at this years #1 online casino for United States - Slots.LV. You may bet in increments of $0.05, $0.10, $0.25, $0.50, $1, $2, $5 and $10. If you don’t want to bet a lot of money per spin, you can bet as little as a nickel. Conversely, if you’re a high roller, you can bet up to $250 per spin. Remember, the larger you bet, the higher your chances are to win! The Spider-Man video slot has plenty of special features, including free spins, an animated bonus game and three Progressive Jackpots (Hero Jackpot, Super Hero Jackpot and Marvel Hero Jackpot) all available at Lucky Ace Casino. All Marvel Jackpots are awarded randomly with no matching symbols required. There is an auto-play feature where you can play up to 100 spins at a time. The auto-play feature is not as advanced as you will find at other casinos where the video slot will automatically stop playing if you win enough money, for instance. You can manually stop the auto-play feature any time you wish. Try webslinging your way to free spins – try Spider-Man out at Lucky Ace Casino! Does the Spider-Man video slot have a Progressive Jackpot? 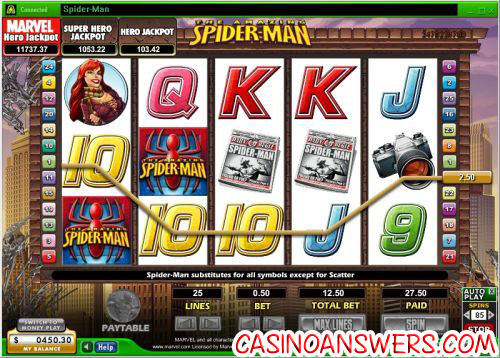 The Spider-Man slot has three Progressive Jackpots. The Hero Jackpot is in the $100s, the Super Hero Jackpot is in the $1000s and the Marvel Hero Jackpot which can go well into the $10,000s! Does the Spider-Man slot machine have a bonus game or free spins? If you hit three or more scatter symbols in a row, you can choose whether you want to play the bonus game or 15 free spins. Where can I play the marvel slots? What marvel slots are there? Is there a Spiderman slot machine?